One of the unexpected joys of the trip has been the pleasure of being with a great team of humans, as well as the stars with four legs. It's been a privilege to have had such an amazing team of friends to travel the arctic wastes with. They were all on the wish list for different reasons, but what was so reassuring was how well everyone got on with each other and how quickly we all fell in to living in challenging spaces and environments together so easily. My tent mate and trusted friend, we've done two trips together now and it doesn't end here.... we are already plotting, watch this space. Laura's boundless enthusiasm and calm in the face of snow, wind, extreme sledding keeps me sane and she's always 'up for it' even when 'it' involves a bikini in a blizzard. We just slotted in together, even down to the design of our luxury girly latrine. 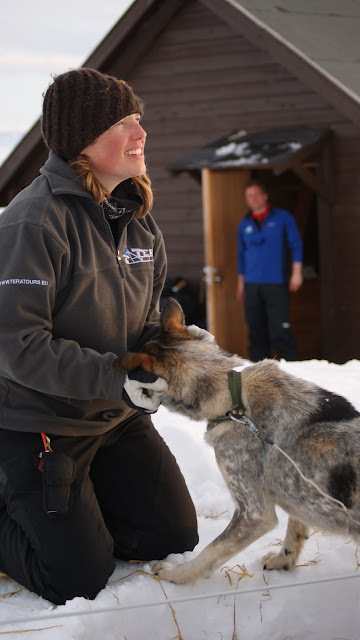 She's practical, caring and can colour co-ordinate thermal underwear in a tent 300 miles north of the Arctic Circle, how does she do it? Our very own Brown Owl, the girls has class. Seasoned traveller and expert in all things airport, we worked out that Steve has a micro chip embedded in his passport, which allows the queue masters to recognise that he means business and the waves part as if he's Moses. You might think that this would put him above mucking in and getting down and dirty but nothing could be further from the truth. 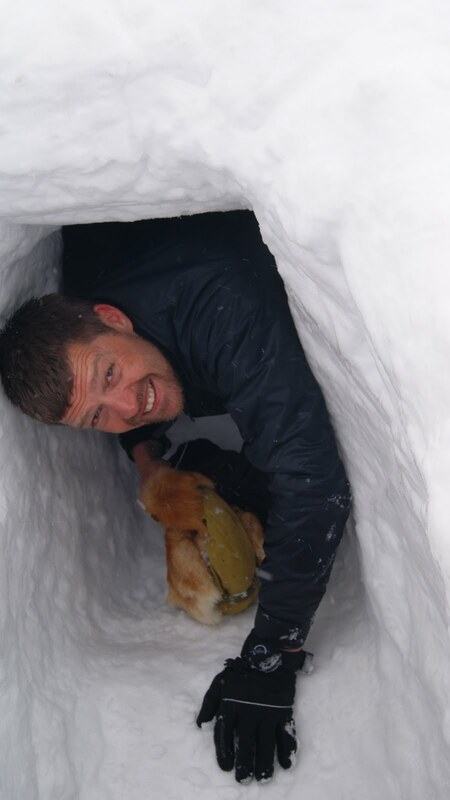 Steve's the first to offer his services for the tricky jobs, digging dogs out of the snow, finding vodka on the snow, keeping the sauna stoked and bringing up the rear of the line with the constant call of "Come on BABE!" and the team wouldn't be the same without him, I'm so glad he came. Mark's a star, pure and simple. We knew his training in the RAF would come in handy but it didn't just give him the skills to build a habitable ice hole for two, it clearly gave him the ability to take the Micky out of us all just enough to keep us amused but not annoyed, a fine line. Mark is a Doer with a capital D, trips like this need doers. Not many people would have thought of bringing a blow up beach ball to the Arctic - Mark did, few would have dressed as a life guard on a frozen lake - Mark did, only a fitness fanatic would have offered to carry all the water back from the lake so that he could "get a work out" after 60km on the back of a sled - Mark did. How many would have admitted to being chuffed that his girlfriend had sent a letter with him, which exploded with glitter hearts all over the tent? Mark did, and we love him for it. Andy did say I should use this photo - mmmm.... pancakes! If positive energy could give you wings, Andy'd have flown all the way home. He's got such a great attitude to life and I know a bit of it rubbed off on all of us over the 9 days. The grin on his face after the first training session on the sled had to be seen to be believed, I though he might pass out. We discovered his talent with the guitar too, such an unexpected bonus. I knew he played but had no idea he had such a great ear and could just listen to something and play it, we were all silenced by his music and I thought that Britt Marie might try to steal him when she heard him sing. I also have him to thank for getting me out of some pretty tricky situations in deep snow, I might have just melted if it hadn't been for him (but I could have done without his rendition of Chumbawamba's "I get knocked down, but I get up again"). In Andy's words: "Man he so cool, without even trying to be". I've known Rob for nearly 30 years, so I knew he could do this without having a hissy fit and I guess I expected him to be able to handle a sled, care for his dogs and produce pretty good food - but not to restaurant standard in a log cabin, using a wood burner. Cool? Yes, but human; he loved his dogs, missed his family and snored enough to keep all the bears in in Northern Scandinavia away from camp. Although Gaynor will tell you that she's forgotten how to be a girl and is now a "farmer's wife, with dog meat on her trousers" we all beg to differ. Gaynor could look beautiful in a bin bag, which is pretty much what our outer layers look like, but hers is trimmed with Artcic fox... We're all here because of Gaynor, it's her generosity that allowed me to put a team together to do this trip, which she never taken anyone on before. She's the boss, and now even the dogs know that. It's been so great to spend time with her and Milos together too, if I had a fiver for the number of times I've heard "My Man's a real man Claire" I'd probably have reached our fundraising target! A real man opens tins with a knife, a real man can start a fire in a blizzard, he walks to the sauna in nothing but boots and chops dog meat with an axe. A real man leads a team of rookies across uncharted territory, up vertical drifts and over roads, lakes, mountains and rivers. A real man tells stories in a language not his own that have us all doubled up, he charms Sami women, hardened to the world and turns them into giggling girls. He says the right thing at just the right time. A real man knows where to find clear water (almost all of the time) and can drill through ice a meter thick. A real man wins 900km sled races and gets the award for being the man who cares most for his dogs. He loves his dogs, he loves his girl.